I love carrot cake. I also love cream cheese frosting. Good thing that these two things were made for each other. 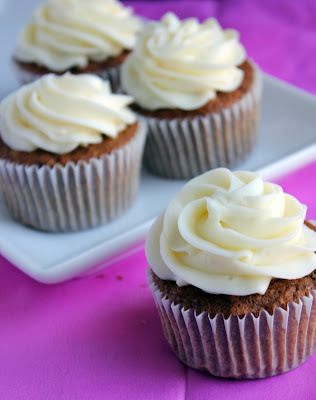 My husband is not fond of carrot cake, so nobody is helping me devour these yummy carrot cupcakes. I made them into cupcakes so that I can give them away. I knew ahead my husband wouldn't eat them. He's missing out! 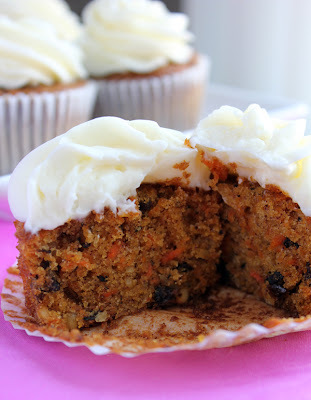 These carrot cupcakes are moist and delicious beyond imagine. They have toasted walnuts, sweetened shredded coconut and currants in them. The currants give them a yummy chewy tangy bite when you get one. It's yummy. This recipe can make 1 small 7-8 inch round cake or 18-20 cupcakes. This recipe is really easy too! 2. Beat eggs with sugar until pale. 2 minutes. Add oil, and mix until combined. 3. Add in dry ingredients. Mix well. 4. Add in carrots, currants, walnuts, and coconut. Mix well. 5. For cupcakes, fill 2/3 full and bake at 350 for 20 minutes. For 7/8 inch cake, bake for 40 minutes. Top with cream cheese frosting on your choice! Oh my goodness, that frosting looks PERFECT! Such beautiful swirls, and you photo shows it off so well. This cake/frosting combo is one of my faves! 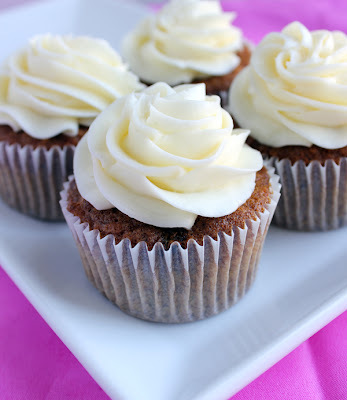 Your cupcakes look so delicious and I love your perfect frosting! I can buy shredded carrots? Really? I don't have to grate them?! Awesome! This is so easy?! I'm totally making these! WIll it work if I sub oil for applesauce? @arunareject Hi! Shredded carrot is available in some stores. However, I do shred them myself using a food processor. It's fast and easy!